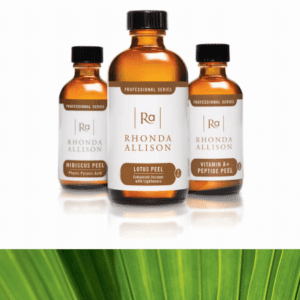 Sesen Skin Care offers both Rhonda Allison and VI Chemical Peels. Extremely beneficial for a wide array of skin conditions, chemical peels remove the skin’s damaged surface layers and dead cells, stimulating new growth and regeneration. Leave hyperpigmentation, rosacea, acne, sun damage, and the effects of aging in the past. Ask us how chemical peels can help enhance your skin’s texture, tone and luminosity, combat fine lines and wrinkles, tighten pores, clear blemishes, balance oil production and aid in hydration for a brighter, healthier you. A mild, foundational peel, The Sesen Progressive helps repair skin damage and boosts glow with virtually no downtime, preconditioning the skin for deeper treatments. Only removing the skin’s outer layer, The Progressive doesn’t typically activate immediate exfoliation – you’ll experience a mild sloughing of the skin with increased frequency of treatments. The Sesen Mid-Depth Peel exfoliates and repairs damage on a deeper level than The Progressive, with a light flaking similar to that of a sunburn beginning two to three days after application. This treatment targets both the outer and intra-epidermal layers of the skin, with minimal downtime and visible results in approximately seven days. *Requires Post Peel Product Purchase and completion of Progressive Peel.